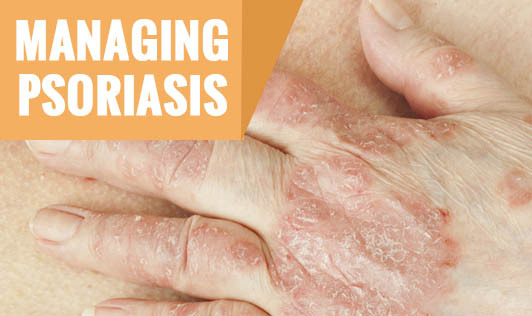 Psoriasis is a long-term skin disease that causes scaling and inflammation. Everything from the temperature of your shower to the fit of your clothing can trigger a reaction. Hence, it's important to take care to prevent and treat outbreaks. • Keep your skin moist: It's important to use a moisturizer as dry skin makes irritation and itchiness caused by psoriases worse. • Bathe, but be cautious: Avoid hot water as it can irritate the skin, bathe in lukewarm water. • Wear clothes made of natural fibers: Natural fibers are soothing for the skin. People with psoriasis often feel frustrated, develop low self-esteem or anxiety about their daily routine and may give up things they enjoyed due to embarrassment and physical discomfort caused by this condition. Remember that lifestyle changes can make a difference in how well you live with psoriasis!